(Phys.org)—A large team of researches with members from China, Spain and Switzerland has traced a strain of tuberculosis known as the Beijing family, back tens of thousands of years. In their paper published in Proceedings of the National Academy of Sciences, the group describes their methods and what their efforts have revealed about the diseases origins. The Beijing family of TB has caused misery for millions of people, mostly in Asia, for a very long time—just how long has now been revealed by the researchers working on this new effort—approximately 30,000 years. They believe it originated in southern East Asia, not long after people first arrived there and has been passed along as the population grew and migrated ever since. To learn more about the history of the disease caused by the strain of mycobacteria (a genus of Actinobacteria) the team sequenced the genomes of 95 representatives of the Beijing family strain, found in China, and then combined them with genome data obtained previously from of 263 strain instances found in 15 other countries. That allowed them to trace the expansion of the disease during its early sublineage as it made its ways across parts of Neolithic era China, and subsequently into other areas during the Han migration approximately six to seven thousand years ago. They note that the disease appears to have become more contagious as it evolved over the years, due to the development of dense population areas. It was in comparing the evolutionary relationships and the way the strains were distributed geographically that allowed the researchers to trace the origin of the strain to its apparent original source. 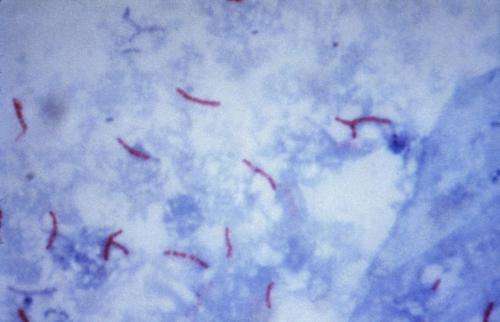 Scientists believe that approximately one third of the entire world's population harbors the TB causing mycobacteria—figures are difficult to obtain because TB can hide in a victim for years before becoming active. Also, after becoming active, it tends to remain mild for several months, allowing the infected person to spread the disease when they cough. The team believes it is likely that the dominance of the Beijing family strain (it is currently responsible for approximately a quarter of all infections worldwide) came about due to the mycobacteria evolving into a hypervirulent strain as a result of the massive population densities that arose following the Han migration and that learning more about its history might lead to discovery of a weakness that might be exploited to help combat the disease. The Beijing family is the most successful genotype of Mycobacterium tuberculosis and responsible for more than a quarter of the global tuberculosis epidemic. As the predominant genotype in East Asia, the Beijing family has been emerging in various areas of the world and is often associated with disease outbreaks and antibiotic resistance. Revealing the origin and historical dissemination of this strain family is important for understanding its current global success. Here we characterized the global diversity of this family based on whole-genome sequences of 358 Beijing strains. We show that the Beijing strains endemic in East Asia are genetically diverse, whereas the globally emerging strains mostly belong to a more homogenous subtype known as "modern" Beijing. Phylogeographic and coalescent analyses indicate that the Beijing family most likely emerged around 30,000 y ago in southern East Asia, and accompanied the early colonization by modern humans in this area. By combining the genomic data and genotyping result of 1,793 strains from across China, we found the "modern" Beijing sublineage experienced massive expansions in northern China during the Neolithic era and subsequently spread to other regions following the migration of Han Chinese. Our results support a parallel evolution of the Beijing family and modern humans in East Asia. The dominance of the "modern" Beijing sublineage in East Asia and its recent global emergence are most likely driven by its hypervirulence, which might reflect adaption to increased human population densities linked to the agricultural transition in northern China.